Here are a few collections of remarkable pieces that have found their homes! Sold! 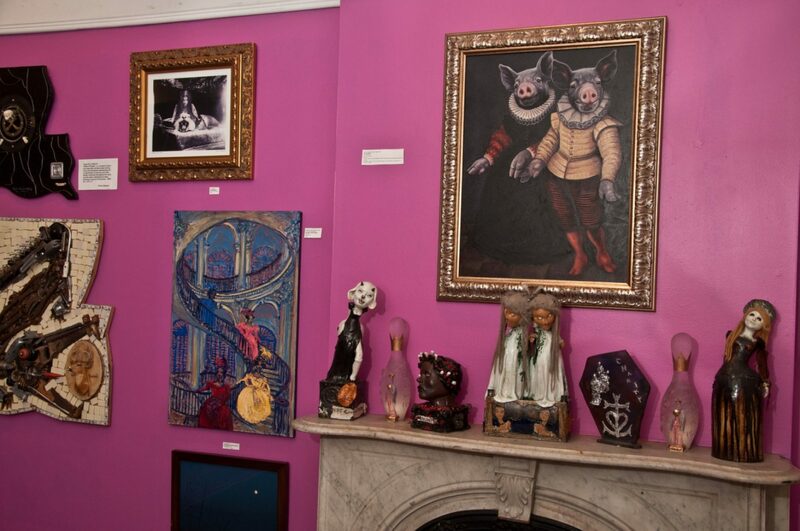 The Tin Queen, by Darla Teagarden, has found her home in New Orleans! By Jane Talton oil on canvas 22″ x 26″ $2900/$5600 for pair “I’ve been told that I ‘live in my own little world’ and I think there’s some truth to that. That little world is an alternate Eden filled with story book landscapes and populated with bizarre, yet friendly, beasts. It’s a slower paced world in which the inhabitants have time to sit for their portraits and it’s considered noble to be just a bit of a clown.” Jane graduated from the Maryland Institute, College of Art in the spring of 1999 with a bachelor’s of Fine Arts after majoring in illustration. Afterwards, she found work painting murals in Virginia. She then moved in 2001 to Boston to work as a caricature artist and freelance illustrator. She never stopped doing oil paintings and in 2004 had her first solo show in Boston. Compelled by joie de vivre, she moved to New Orleans in the autumn of 2006 and has never regretted it. Here she’s found fertile ground for her imagination and has shown at Palmer park, the Jazz and Heritage Museum, and the CAC. She has also done work in television as a police-style sketch artist in two seasons of ABC’s “Dating in the Dark” and the Travel Channel’s “Dead Files”. Her work combines a sense of humor and light-heartedness with the technical skills picked up in her 20 years of painting. Stoneware hollow hand sculpted doll by Lateefah Wright.